Alki Beach is the kind of place that makes living in or visiting the Northwest such a treat. This stretch of beach in West Seattle is a great spot to relax, play, enjoy the scenery (downtown Seattle is across Elliott Bay so the skyline views here are just about perfect), or even explore some Seattle history as it was the landing site for the first white settlers in Seattle — the Denny party. With volleyball courts, sandy beach, a pathway for walking and stellar skyline views, Alki Beach is awesome in the spring and sunny summer, and equally awesome on moody and gray fall and winter days. First and foremost, Alki Beach is a beach. 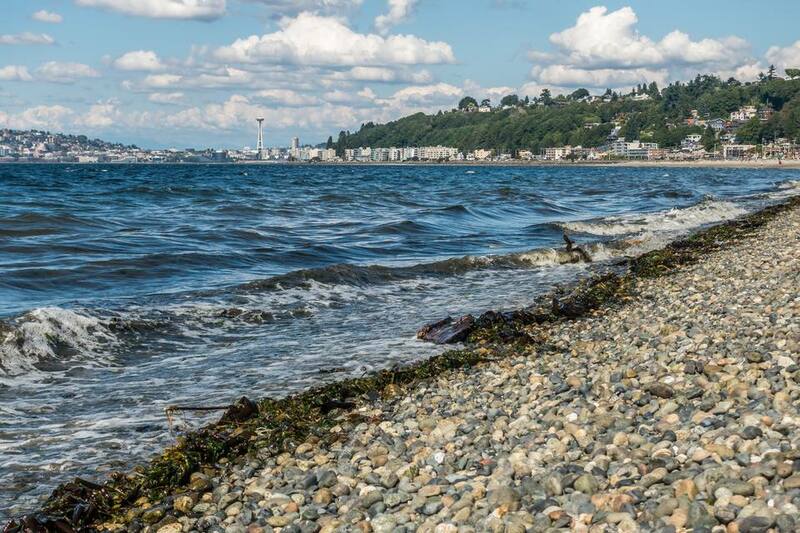 The entire stretch of beach is lovely, but for full beachy fun, head to Alki Beach Park where you’ll find the bulk of the things to do clustered together. Unlike many Northwest beaches, it actually has sand so you can spread out a beach towel and relax, have a picnic or build a sandcastle. Like most Northwest beaches, expect tidepools and driftwood and seaweed — all of which make tidepooling a worthwhile activity. Whether you relax on the beach, at a picnic table or otherwise, Alki Beach is an excellent place to stop and enjoy the view as you can see downtown Seattle, the Olympics, the Puget Sound and plenty of boat traffic meandering by. Alki Beach Park has volleyball courts that are in high demand during warmer months. Bring along your own ball and net and make sure to reserve your court in advance by calling 206-684-4062. Alki Beach Park is one of only two parks in the city of Seattle that allows bonfires, and it allows them all year round in designated fire pits that are first-come, first-served. Watch the sunset or stargaze or roast some s’mores. Walk, run, roller blade or otherwise get out and get active along the beach trail, a paved strip that goes for 2.5 miles and offers up beautiful views of the city and Puget Sound. There are a number of restaurants along the Alki Avenue SW, which is the road that runs parallel to Alki Beach. While Alki Beach spans most of the West Seattle shoreline, most restaurants and facilities are located in or near Alki Beach Park. These include restaurants like the popular Cactus, a Mexican restaurant with cocktails and a view of the beach; Duke’s Seafood & Chowder, a local chain with several varieties of delicious chowder; Blue Moon Burgers, which serves burgers in a converted auto garage; Spud Fish & Chips, which has a walk-up counter; and El Chupacabra, another Mexican joint that’s more bar-style than Cactus and that’s known for its beachfront patio. Farther east down the beach are another couple of dining options — Salty’s on Alki, a more upscale seafood restaurant with excellent skyline views, and Marination Ma Kai, which serves Hawaiian and Pacific islands-inspired fare. In short, you'll find no shortage of places to dine near Alki Beach whether you want to enjoy a quick bite or some fine cuisine paired with a water view. In addition to spectacular views of water, city and mountains, Alki Beach also has a few points of interest. The Alki Point Lighthouse is still in operation and has free tours on weekends during the summer. It was built in 1913. If you want to get up close and personal with the lighthouse, you'll find it at 3200 Point Place SW. If you dig on local history, look for the Birthplace of Seattle monument at Alki Point, near Alki Avenue and 63rd Avenue SW. This is the spot where the Denny Party landed in 1851 and built a settlement that they called New York Alki (“alki” is a word in Chinook that means eventually so they had big plans). However, the Denny Party had to abandon the site in less than a year due to hardship there. Alki Beach even has a miniature Statue of Liberty at Alki Beach Park. The statue stands 6-feet-tall and was installed by Boy Scouts in 1952 (but had to be replaced with an exact replica in 2007 due to repeated vandalism). You can get to Alki Beach in two ways. You can drive by taking the exit for the West Seattle Bridge off of I-5 just south of Seattle proper. From West Seattle Bridge, get onto Admiral Way and follow it through the neighborhood as it bends and twists a couple times. You can take a right on any street between 59th Avenue SW up to 63rd Avenue SW and you’ll run right into Alki Beach Park. You can find street parking along Alki Avenue, but it might be competitive on beautiful days. Alternately, you can also take the West Seattle Water Taxi from the downtown Seattle Ferry Terminal. The ferry takes about fifteen minutes to cross and drops you at the far eastern end of Alki Beach near Marination Ma Kai and Salty’s and in a prime spot to enjoy the Seattle skyline. You’ll also get some pretty stellar photos and views of the skyline from the water taxi. Alki Beach Park at 1702 Alki Avenue SW has picnic tables, a restroom on the southern end of the beach, fire pits, grills, a bathhouse with an art studio, and hand-carry boat access between 53rd Ave. SW and 55th Ave. SW, and on the west beach shoreline.